Synopsis: Hushpuppy (Wallis) is a 6-year-old girl living in a New Orleans-like area called “The Bathtub” with her father, Wink (Henry). Wink does his best to prepare his daughter for a universe where he’s no longer around, and when he falls ill and the area floods for numerous reasons, Hushpuppy starts to learn hard and fast about what her universe will be like someday. Andrew: Hello readers! Yesterday afternoon Sarah and I went and saw Beasts of the Southern Wild at a theatre in Hartford, since it has yet to come to our local AMC. This is a movie that has been making some noise because of its young star, Quvenzhane Wallis, who plays 6-year-old Hushpuppy. She’s being lauded for her performance – some even going so far as to say she should be nominated for an Oscar – in a film that’s a fantastical, fictional take on what happened in the New Orleans region and the flooding there. So we finally checked it out, and I have to be honest…maybe it’s just that it wasn’t the right day for us to see it or I wasn’t in the right mood or frame of mind, but I just did not get it. 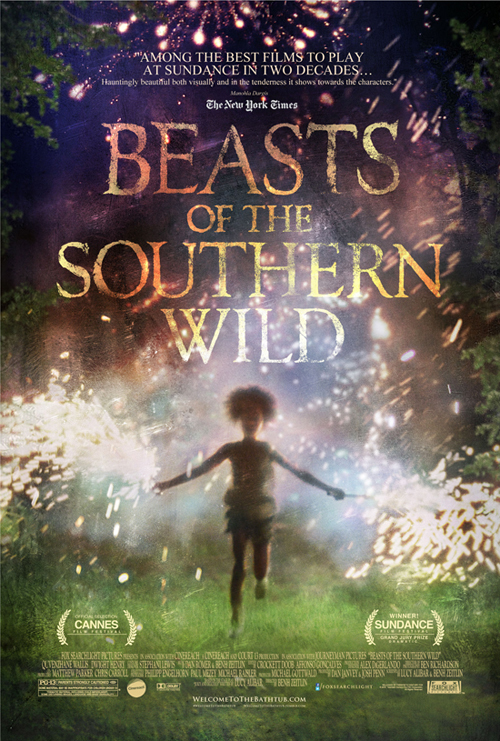 I…I mean, I GET IT, but at the same time I did not like Beasts of the Southern Wild. Sarah: Yeah, I’m not quite sure what we were missing that everyone has seemed to taken away from this movie. While Wallis does a FANTASTIC job for a 5-year-old, portraying a lot of emotion through her facial expressions, I didn’t quite see the appeal. There were several things that I found wrong with the movie, and while it was a beautiful movie, the hand-held camera technique used to film it was VERY distracting, in my opinion. A: I’m going to go with a stronger word than “distracting.” It was nauseating to me. And this almost NEVER happens to me, but the camera movements in this film gave me a headache. One of the strongest headaches I can ever remember getting. And I never, NEVER walk out of a movie but I seriously considered it yesterday because I could not take the shaky camera movement. Now, I understand why Benh Zeitlin and his cinematographer Ben Richardson shot it like that. It was low budget, it made it feel like you were right there with the characters, and a lot of the time it worked fine! But a lot of the time it was completely unnecessary, completely took me out of the movie, and it probably put me in a bad mood. Which I’ll totally own up to. It gave me a headache early on and for the rest of the film it probably put me in a bad frame of mind to watch the rest of it. S: I didn’t find…I understood the connection that Hushpuppy had with her father. I thought that was very prominent throughout the movie and was really heartwarming. I’d even say that I think that Dwight Henry’s performance as Hushpuppy’s dad, Wink, was more Oscar-worthy than Wallis’. A: I completely agree. I mean, neither one of them was an actor before this movie, but Henry was apparently just a shop-owner who the filmmakers really liked when he auditioned for the part. THAT'S an Oscar-worthy story. A: And a lot of her lines are voice-overs. S: Yes, a LOT of them are. And they’re her, but done after the fact. S: No! Of course not! A: Because of course all actors are coached and have multiple takes done…but I agree with you. I think Henry does a phenomenal job. I wasn’t enamored with the script because a lot of times (and maybe this was supposed to be his character) but he repeated the same things over and over and over again. It grated on me. S: It really got to us. And I will applaud them for that. Because I’ll tell you that I never walk out of movies either – I think it’s one of the rudest things you can do – but I was bored. And I don’t fall asleep in movies but I found myself shutting my eyes and just kind of resting them. And that, I feel…when we left I just wondered what we missed in the overall picture. Because we just didn’t see it. So we ask you, readers and fellow bloggers, please explain to us what we missed. If we could understand this movie a little more than of course we might get a better appreciation for it. A: And I’ll be happy to go back and watch it on DVD and figure it out, but I just don’t see where the “4 out of 4 stars” reviews are coming from. But the thing to me is just…this film came off as VERY pretentious a lot of the time. S: It’s very much like a film-student’s project. Long story short, can somebody please explain to us what the heck the deal with the aurochs is? Please? Was it really just for this one scene where Hushpuppy stands up to them? A: And “pretentious” is just the word that keeps popping up in my head, and I don’t know why. I will say that it was strong at the beginning when we’re being introduced to The Bathtub and Hushpuppy, it was strong at the end, but the middle ground lost me. And I really do want to know what Hushpuppy whispered in her mom’s ear at the end. That’s something that will always keep me wondering. S: Totally. Also, was it even her mother? We never actually see her mother’s face when her dad is telling stories about her, but Hushpuppy identified with the woman. A: Well, I think it was because the woman makes crocodile for Hushpuppy, and that’s what Wink says her mother made the night she was conceived, so I think that was their way of showing it was her. But maybe it wasn’t! Zeitlin kind of left that gray. Overall, the beginning was good, the middle ground lost us, the end was fine, but I just found it pretentious and I did not get aurochs. Those big pig creatures? I didn’t understand what the point of them was. S: Me neither. 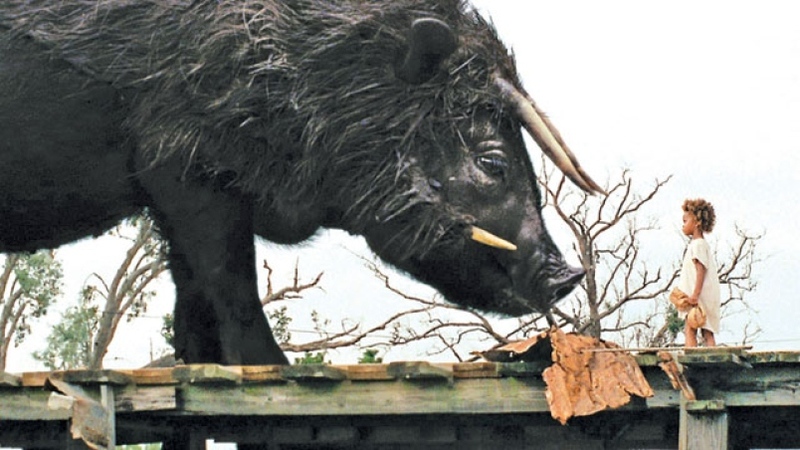 So yeah, overall Beasts of the Southern Wild is not a bad movie, it just didn’t connect with us. A: And it made us nauseous. Like, literally dizzy. Well probably have to give it another shot, but absolutely readers, if you would like to discuss this with us we would love that. S: Yes. And I’d say we’d suggest not seeing this in theatres. The chances of you getting to see it in theatres is slim anyway, but I think because of the hand-cam it makes it a tough one ot watch on the big screen. Thank you for the comment! We haven't had a chance to check out "Hyde Park on Hudson" yet but now that we hear they employ some of the same camera techniques, that kind of worries us!